Thomas Alexander Lynn was the eldest son of Samuel and Isabella Lynn. Alex, as he was known, was born in 1918 at Tattyknuckle, Fivemiletown. The family moved to Newtownards in 1940, but Alex had already moved to England in 1938 to seek work. 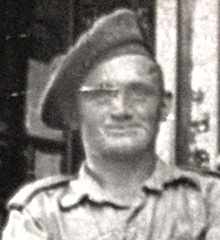 After the outbreak of war Alex was serving with the British Expeditionary Force in France and was evacuated from the beaches in Dunkirk in 1940. He was then posted to North Africa and served at Tobruk. 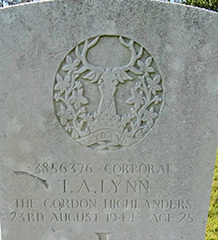 Corporal Thomas Alexander Lynn went on to serve in the invasion of Normandy and was killed in action on 23rd August 1944. St Desir is a village on the N13 to Caen, 4 kilometres west of Lisieux. The war cemetery is about one kilometre west of the village and lies on a secondary road, the D159.